Buildings under water in Hamburg. 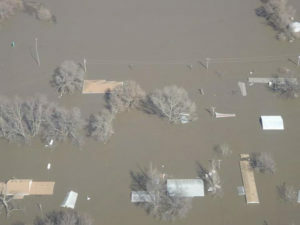 Floodwaters are gradually falling but residents in four southwest Iowa communities who were required to evacuate due to flooding haven’t seen their homes in about two weeks. Crecelius says this second major Missouri River flood within a decade is disastrous for the region. “Bartlett, in 2011, only had three to four feet of water in it,” Crecelius says, “and this time, Bartlett had water to where you could only see rooftops.” He says the river needs to drop below flood stage before communities can start to see relief. The National Weather Service says snowmelt from South Dakota is coming down the river, and that’s one thing delaying water levels from dropping.